Stepping Up – If you want it, what are you going to do to go get it?! I am very grateful for the life I have. My parents were blue collar workers who did everything they could to make sure my brother and I had what we ‘needed’. The biggest gift my parents gave me was the motivation of hard work. If you wanted something bad enough, you would work hard to go get it. You never left anything to come to you in life. To this day, I do not think I am the smartest person in my field, but I put forth the discretionary effort to set goals and work relentless to achieve them. I was recently at a conference with a couple exceptional speakers. On the first day, I was fortunate enough to meet Dr. John Izzo, author of the book Stepping Up. His message was succinct; we need to take responsibility for how we perform and make change. I can spend hours practically applying his key concepts to the business world, but instead during our discussion I thought a lot about shooting. Over the course of the past two years there has always been a lot of, let’s just say, reasons why someone places better than us in competition. Some of these reasons may be legitimate IE; you do not maintain a preventative maintenance regimen on your firearms, you make changes to your setup prior to a match, the ammunition you use is problematic during the cold, etc. One of the many concepts he talked about was taking 100% ownership with 0 excuses. The key takeaway, for me, was you have choice. If you are satisfied with your current placements and results, then keep doing what you are doing. If you are not satisfied with how you are doing, then what are you going to do to CHANGE things? As a previous mentor has told me, hope is not a plan. We must make a plan to change our course. What is your plan for the rest of 2018? Are you going to practice at all? Are you just going to shoot local matches? Are you going to get help from an expert in the sport? What is it? In order to truly get better you have to write down a plan and hold yourself accountable to it. What am I going to do differently? My wife and I are making a large financial decision to sell our home and buy a home with property to have a range. This will allow me to shoot more and not compromise the time I have with my family. This change will also allow me to expand what I truly love to do, teach. It will be great to have a place to bring fellow competitors to where we can work out some of their stumbling blocks and continue to grow the sport. I truly believe focusing on the fundamentals makes both the teacher as well as the student better. Just remember, results lag change. If you change something in your routine, your equipment, etc you will not see the results immediately in most cases. Just know you are making the right decisions and positive results will follow! Now, what are you going to do?! Sometimes you know that something is not a good idea, but you do it anyway. Just like the time my brother started a fire in our wooden fort. No, it gets better. Then we thought it would be ‘cool’ to see what would happen if we tossed a lighter into the flame, inside the wooden fort. Insert your best Wylie Coyote clip here. *Kids don’t try this at home. Still not sure how my brother and I made it into adulthood?! I tell you this brief example because a lot of us look to facebook posts, Instagram, and other social media platforms for ideas. I think they can be a great way to shorten the learning curve, but just because something seems like a good idea, it may not be right for you. People have told me over and over again you want to have the red dot sight as far forward as you can on a hand gun and on a rifle. I have tried this method over and over again and something just does not feel comfortable. I first made a change with my Tactical Solutions Xring and brought the sight to the middle of the receiver and it worked. When I pulled the gun up – the dot was right there and the viewing window was perfect, for me. This got me thinking about my PCC. After shooting the Alabama State Steel Challenge Match in December, where I shot a record 67.59, I was hesitant to change anything in my configuration. I was shooting my JP GMR 13 with my Vortex Razor 6MOA towards the front of the ejection port. The sight picture was good, but it was not at the same comfort level as my Xring. So, I did what some have said not to do, I started shooting my JP GMR 15 and I moved the Red Dot back on the receiver to the back of the gun. As soon as I picked up my gun – the sight picture was very familiar… it was comfortable. I decided I was going to put this configuration to the test at the local match at Strongpoint Shooting Complex in Waverly Hall Ga. I was relaxed and more confident than I have ever been with the gun. I asked a fellow competitor to video Accelerator. I shot a personal best this match logging a 8.17 with a personal best 1.82 on the fifth and final string. I share this experience and example with you to say it is perfectly fine to listen to advice, but make the best decision for you and your setup. The best golfers in the world don’t use the same golf clubs, the same loft, the same ball, etc. They use what works for them. Educate yourself and listen to people who have been in the game, at the highest levels, to shorten your learning curve and then make the right adjustments for you. This installment of the mini-series on Perfect Practice, I am sharing a real world example of someone I am working with and coaching them on how to be a better shooter. In my ‘day job’ I strongly believe in giving tools and tips on how to improve your practical application. One of my pet peeves is people pay a lot of money for training and all you get is situational generalities. At the end of the day, the rubber needs to meet the road – you need to see an increase in performance. I am working with someone 1,000 miles away to help them be a better shooter. His raw talent is something many of us, including myself, admire. Now he can shoot fast, but he needs to train how to not miss fast and be more consistent. At the highest level of our sport the top spots are determined by who has less misses or has fewer make up shots. In order to work with this person from a distance we decided to start off with some Steel Challenge Stages so I can coach him because I know what it needs to look like. We had our first coaching session on 5 To Go and the link to the second video with his pistol is located on youtube at https://youtu.be/fBd3Q_fbAHk. Below is my response to his video. Hopefully there are some tips you will find in watching the video and where I have offered some insight. Got your video, looking good! The first run was very deliberate. I am sure in your mind it felt like you were going slow. Shooting well does feel this way! You saw the plate, put the dot on it and squeezed the trigger. Your transitions to the stop plate were perfect (last session we had only 2 of 5 hit on the first shot). Nice work! A lot of improvement in a short period of time! The first run of 2.35 is about 85% -90% for you and is a great first run, right where you need to be. The 2.17 is a strong run and your EDGE is probably in the 2.05-2.10 range. You got a hold of the 2.05!! The problem after that was you were trying to shoot under 2 seconds with your last two runs and going over the EDGE! These make-ups put you in the 2.55 and 2.57 area. If you would have stayed in the 2.17 run after your first one.. you would have shot an 8.68 which is probably in the top 1-2% of people shooting RFPO right now. Instead you ened up with a 9.08 which is probably in the top 5%. This may not seem like a big deal, but you cannot carry a lot of pickup shots or guys like me and Ron or Trenton will beat you all day long. If you did this over the course of 8 stages, this is 3.2 seconds and this is more than what I bested one of the top shooters by with my RFRO last weekend. It is that close of a game. In Fact at the 2017 US Steel Shoot the top three PCCO finishers were less than a second a part. You had a solid first shot on all first targets and your second targets. This stage got you where it gets everyone.. the tendency is to speed up on plate 3 and 4. If you stand in the shooters box,,, compare the size of plate 1 to plate 4… Plate 4 looks half the size doesn’t it? So why do you think you can shoot that one as fast as the first plate? Keep this in mind and you will be in the 2.10 range all day. Get you a solid first string and dial it in to the 2.1-2.17 range and stay there for four consistent runs. Soon, you will not even have to look at the timer because you will know how fast you are shooting. For the next outing do it again and see if you can stay between 2.15 and 2.25 after a first run in the 2.35 range. Going faster than this will only slow down your overall times. Do this consistently and then try pushing it at the end of your training session! You have to shoot fast to shoot fast! He stated, so I just have to be more consistent and I said; It is more than consistency. It is the mental part of this game. You can shoot fast, but you have to learn how to shoot consistently. It will build when you go from stage to stage. This will help you in Rimfire Challenge as well. You will learn how fast a stage can be shot and then be consistent. The use of video can be a very powerful tool for training. It can be both beneficial for self-examination as well as for other shooters to help one another 1,000 miles away. Will it work next time? While growing up in the frozen tundra, Upstate New York, I did not do a lot of shooting during the winter months. Now that I live in the south I wear a badge of honor to shoot all year round, even if it is a balmy 24 degrees. The cold has a way of exposing issues with your gear. I have not heard too many people say “it was so hot my gun would not run”, but I have heard “it was so cold my gun would not run”. Most of the time, with rimfire guns, it comes down to ammo. Most rimfire ammunition has a bees wax, paraffin, or combination of petroleum based coating on the bullet to protect the bullet as well as provide a level of lubrication. If there is excess wax, when it is cold, the wax has a higher level of viscosity which means it is tougher to move in magazines and feed into a gun. Wiping excess wax off with a brush or towel will help your guns run. Another good strategy is to place a warming device in with your loaded magazines or ammo such as ‘Hot Hands’ or Zippos new electronic hand warmers while at a match. 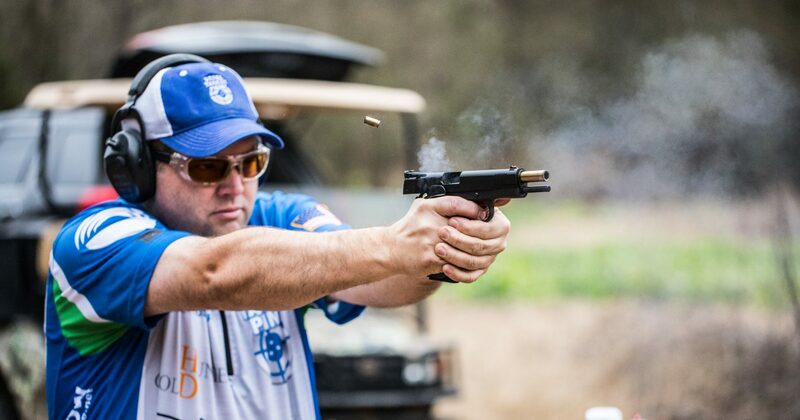 While shooting at the 2018 Georgia State Steel Match this weekend, a competitor was having an issue with his gun. On the very first string there was some sort of gun malfunction with his rifle after the first shot. He spent ten seconds or so, which probably felt like 5 minutes, to clear the jam. He appeared to have a live round finally chambered and then he finished the string. He was able to shoot four more flawless strings of fire, going one-for-one after the malfunction. I was impressed with his level of concentration and he shot some fantastic times. When he returned from the firing line I asked him what happened and he said the gun would not chamber the round. He asked me what I would have done. I told him every time I have a malfunction I try to clear it quickly and if I can’t I look to diagnose what is going on, try to fix it, and finish the string. It is VERY important to clear whatever malfunction happened and make sure the gun runs. This is important because if you clear a jam and don’t test the gun (while on the clock), subconsciously you will wonder if the gun will go bang when you pull the trigger. It is unfortunate if you have one malfunction; you cannot afford two strings on a stage where you have malfunctions. At a high level of competition, it will certainly take you out of contention from a spot on the podium. I too had one issue on the very first stage of the match. It looked like a feeding issue. I put in another magazine, chambered a round, and finished the string. The thought of “this is going to be a long day” did flash into my mind! Fortunately, I brought six magazines to the firing line and finished the stage without disrupting my concentration. I did not have another single issue during the match with any of my gear. After returning home, I took the magazine down with the TANDEMKROSS 10/22 magazine take down tool and I found a little bit of wax in the magazine. It must have been just enough wax to harden and negatively impact the rotary magazine from spinning at the correct speed with the correct force creating the feeding issue. A good reminder to clean your magazines before they actually need it! First and foremost, I hope everyone had a great and safe Holiday Season! During the time off, I had the fortunate opportunity to do some training with members of the Steel Target Paint family. In discussions of what Steel Challenge stage we wanted to practice there was unanimity to Pendulum. During practice you need to make sure you understand where your “Edge” is as I have previously written about. My “Edge” for this stage with a Rimfire Pistol Open gun is 2.35 seconds. As a reminder, I feel comfortable I can get all 5 one-for-one hits in 2.35 seconds on a consistent basis. As I ran several strings of fire, what I have trained for took over as second nature and 1-2-4-3-Stop Plate proved to be the fastest sequence of fire. After 20-30 strings of fire I regained the confidence I have been seeking to apply at my next match. During the training session a phenomenon happened. It is what I call a “Practice Edge”. When I was shooting my strings of fire I kept on getting faster and faster. With every shot and hit I made I pushed my “Edge” on the stage and to my surprise I was connecting. It was not long, I was shooting 2.10, then 2.05, then 1.95, and THEN 1.90! I tried to push past 1.90 and then the wheels of the train started to come off the tracks! I did have an experience, coined or at least made popular by Tom Naelon, “The Blind Squirrel Run”, where I connected on a sub 1.90 once out of 5 tries. If you have noticed at US Steel (often called ‘The Nationals’) or the World Speed Shooting Championship (WSSC) you will see competitors run through the stages the night before. The concept is to re-establish their “Edge” and get a “Practice Edge” that will ‘stick’ for the next day’s competition to gain as much of an advantage as possible. The lesson in all of this for me is to not get frustrated if you are not shooting as fast as you did after shooting a stage 50 times in practice. Shooting a stage over and over again will help the message from your eyes – to your brain – to your body to react quicker and quicker. You will see your times get lower and lower. There is no substitute for pulling the trigger out on the range! During the time I was playing basketball my cousin came over for Thanksgiving and brought this strange stick with a net attached to it. I asked him what it was and he called it a Lacrosse Stick. I was enamored with it and lucky for me he had two. In a frigid upstate New York we spent the next 5 hours playing catch and rolling the ball to each other. It was on this day I found a passion for a sport I would spend the next 20 years of my life. Fast forward to my senior year in High School. We were playing in a sectional game to advance to the next level of the state playoffs. I was wide-open, caught the ball, ‘cranked-up’, and let loose a 90+mph shot… I was certain I had the top right corner of the net open and I heard the sound no lacrosse player wanted to hear. It was a ‘ping’ and I hit the corner cross-pipe of the goal. I was certain I had it. When reflecting on my shot I realized I took my eye off my target before I completed the motion of the shot and it threw my shot off course. Needless to say this ended our season. This experience happens a lot to me and others in shooting. This experience is what I call “Gap Time”. This is the time when your brain decides you’re going to fire the gun, your eyes will move before your finger pulls the trigger, your gun starts to move with your eyes and that’s how you start missing. This phenomenon happens all the time to new drivers. If a new driver looks to the left, what happens to the car? It goes where their eyes are going – to the left. This all may seem simple to keep under control until you are under pressure and the timer goes off and your squad mates are throwing down some fast runs! Let’s break down why it can be difficult to shoot well. Maybe it will make you feel better, there is a lot going on. Warning, reading this may give you a headache. Here is the order of operations assuming you have a ‘hit’ on your first target. Where our shooting fundamentals start to break down when we are ‘rushing’ is our Brain goes from Step #8 to Step#11 and skips step #9 and #10 completely. 9. Your Eyes see the sight picture of the gun on Target #1 when the shot breaks and sends confirmation to your Brain. Your eyes are heading to the next Target instead of holding them on the first target until the shot breaks, this is where the “Gap” is created. You expect to get the desired results, but you short-cut the physiological shooting steps. When you are practicing by yourself, think through the steps listed above and determine which step you had a “Gap” on or which one needs some attention. Some self-diagnosis will help your valuable training time be more meaningful! One of the best times I ever had playing organized sports was 6th, 7th, and 8th grade basketball. In three years we only lost two games. Wow, it was great to win! We did work hard. We would practice six days a week and we would practice for an hour and a half each day. Our coach, Bob, made sure every minute was valuable and we would work on at least one skill or aspect to our game. You could not argue with his preparation and practice regiment. We were merely an average group of kids who were able to accomplish amazing feats solely because of our practice regiment. Some say “Practice Makes Perfect” and this is not entirely correct. There is value in pulling the trigger to prevent this skill from degrading. However, as my Middle School Basketball Coach always said, “Perfect Practice Makes Perfect”. It took a while for this notion to set in. His point was simplistic, but very profound. If we spent the entire practice working on dribbling the ball while looking down and with only our strong hand we would get good at this, but what value would this present in a real game? Shooting is exactly the same concept. Very important! If you want to get better you have to practice. Shooting just matches may help you get better, but you will not see the incremental improvements you crave and deserve. For a lot of us, shooting is not how we make a living so our time is precious with our day jobs, family, and friends. This is why maximizing our time out on the range is very important. So, where do we start? Each shooter is different and there is not a universal answer. Let’s focus this discussion on Steel Challenge, for now. What is your current classification? What is your goal? Pick one Division to go after to start with. Let’s say you are a Master Shooter in Rimfire Rifle Open (RFRO) and you want to be a Grand Master. Look up your classification at http://www.steelchallenge.com/steel-challenge-classification.php. As you can see below this student is a Master at 87.98 % of the ‘Peak Time”. Next, let’s look at where she needs to work on. Below is a table from the same page in which her classifications are based off of by match, date shot, stage, fastest time the stage was shot, and the peak time for the stage. So, what does this mean? Let’s do a little Excel work and see how she is classified for each one. As you can see below, she is a Grand Master on one of the more challenging stages 5 to Go, this is a good sign. She is a Master Class in five other stages and she has two stages where she is an A Class. Now, with this information in mind, what does she need to work on? Let’s prioritize, I like lists of three, the top three stages she needs to work on. As you can see below, in order, Outer Limits is a usual suspect and is the very first one to work on. This is followed-up by Smoke and Hope and then Speed Option. We need to get these lingering A Class Stages in the solid Master if not Grand Master Classification! Recently, I participated in the 2017 Alabama State Steel Challenge match at the impressive CMP Range in Talladega Alabama. I am pleased to share I shot four different divisions and three of the four divisions were personal bests for me. These times were enough to earn three out of the four top times shot at the match. So, why did this happen? How did it happen? What did I learn or re-learn during this one minute and seven seconds of actual shooting my PCC? Great questions, I have been doing some self-reflection and I want to be able to repeat and improve on this performance. Confidence: is defined as a feeling of self-assurance arising from one’s appreciation of one’s own abilities or qualities. I have always been confident in my abilities, but sometimes I have stepped up to the Shooter’s box at major matches doubting my ability. Nine times out of ten, if I lack confidence I end up missing or going back to a target and putting an extra shot down range. In my PCC performance, it was not a clean match, but I only had to carry 4 extra shots for the match. The strings where I had extra shots had moments where my confidence faltered. I had a sliver of doubt I was going to be successful and sure enough, I wasn’t. The opposite was also true. I walked up to Five-to-Go and told myself I was going to crush this stage by seeing the target, when the sight hit the target I was going to pull the trigger. I was amazed when I heard the times being called out, I shot my fastest time with any gun of 7.86 seconds. Visualizing what you are going to do and then maintain the same level of concentration of executing when the timer goes off is very important. Relax: is defined as make or become less tense or anxious. This is an area that I continue to work on and is not natural for me. I care a lot about how I perform both in my professional life as well as in my shooting life. I have talked about this before in a previous post. 9 months ago I struggled at a major match and it was because I was not relaxed. Somehow, I finally realized why my shooting performance was not where it should have been because I was anxious and I started missing. When I missed, I missed some more because I knew I was dropping seconds on every stage. Spending time with friends and having a good time is my goal at a match. Every day I feel grateful I have the freedom and resources to exercise my 2nd Amendment right. When I focus on this, the anxiety subsides. Fun: Well, it’s just fun! First and foremost anytime you are handling firearms it is very serious business. A bad situation can occur in a split second; proper gun handling is always paramount. Gun Safety is always first! I had the fortunate opportunity to squad with a lot of great friends. We catch up on topics on the range and off. Regardless of what level you compete at you cannot go a match without talking about gear or ammunition. It is important to remember why you love to shoot. Again, it comes down to the people and the competition. When you are relaxed your body moves easier and it is easier to shoot well. If you don’t believe me hold up your trigger hand and make a fist as hard as you can. Now, with a clenched fist, extend your trigger finger and imitate pulling the trigger with your fist still clenched. Do you see how your whole hand is moving while you pull the trigger? Now, perform the same exercise by clenching your fist with only 40% of the pressure you previously had. Notice how your hand and wrist stay in one position? This is a microcosm of your entire body when you shoot when you are tense vs. relaxed. Training: is the process of learning the skills that you need for a particular job or activity. In practice or local matches you have shoot better than at a major match. Don’t over think it and trust your training. Imagine you are in your basement dry-firing and pulling up on the first target. Remember what you did and your state of mind when you crushed Smoke and Hope at your local match. It is easy to type and can be challenging to do, but just shoot. There is a lot going on when you step to the line and the buzzer goes off. Remember, be confident, trust your training, stay relaxed, be safe, and have fun! Last week’s blog post was a large success and it made me think about what others do. Martin Gephart and Jeff Jones have been so gracious to help us all out by answering the same questions to offer their perspective and some other nuggets of information. Specialties: SCSA – Rimfire pistol open, Rimfire Rifle Open, Open divisions. Occasionally dabbles in PCC, NSSF Rimfire challenge events, USPSA production division competition, Trap, and sporting clays for fun. Q: When I shoot a stage I always try to come up with some sort of plan. Steel Challenge is pretty straight forward. I know the stage ahead of time and have a plan. With NSSF, the best way to shoot the stage isn’t always apparent. Do you ever have a stage where you told yourself you were going to shoot it one way, but when the beep sounded you shot it differently? A: Yes, but I always shoot all the strings on a stage the same way once I start. Muscle memory will always make each successive string faster than the last. Changing the way you shoot your plan mid stage is not helpful for me. So…if I throw out my stage plan on the first run, I stick with the new plan for the next 4 strings. That said, I always have a plan, and if I am going to change things up, I try to do that only in my practice sessions and not in competition. Q: Any pre-match rituals that you’ve found really helpful? Do you avoid certain foods? Do you have to have a certain amount of sleep? How do you calm down if you get really nervous? A: Yes. I get a good nights sleep. When I prep for a match, before I leave the house, I always double check the gear and guns to make sure I got everything I need for the day for each gun I plan to shoot. Once they are in the car…I check again. For each stage: I watch the previous shooter, I clear my mind, and I play my plan over in my head. I listen to every shot timer beep, and focus on nothing but how I plan to shoot the stage. When I step into the shooters box, I tell myself PMI (Positive Mental Image). If I am confident I will perform, I will perform. Focus, and positive thought. Lastly at make ready – trigger prep, air gun the stage, load and nod that I am ready. Game on. Food prep: 1 20 oz sugar free Red bull…1 20 oz Diet Mountain Dew…and a good breakfast a couple hours before shooting. Snacks for every 2 or 3 hours to keep my blood sugar even for the duration of the day. Lots of water. Q: Do you dry fire practice? How often do you do dry fire practice? Does it actually help? A: Yes, and it is never enough. I try to get a few minutes each day for dry fire. I focus on trigger prep, and sight acquisition. Just 10 mins a day has done wonders for me. I also use a guitar finger strengthener. I use it in the car. Slow, deliberate trigger finger resistance work. Every time I get in the car, at least one full match worth of trigger pulls on the tool. Q: Any tips on maintaining confidence? A: When I first started, I would not keep a PMI (Positive Mental Image). I would run a bad string, and focus on the things I did wrong…and they would get worse. A friend of mine kept encouraging me to eliminate the negative thoughts I had, and focus only on shooting the next string better than the last. That really helped me stay confident in the box. I only measure myself against my own shooting goals, with the intent of improving just one thing every time I compete. I am only competing against my own goals and myself. Who wouldn’t be confident facing themselves in the mirror? Thanks Steve for letting me contribute. Looking forward to hearing what others have to say. Not so much on the beep, but between strings I have changed plans. Showdown is a perfect example. My plan going in is 2 on the left, 3 on the right (I place 3 mags on the right side, no chance of shooting too many strings from the left). After my 4th string I’ll make a decision where to shoot the 5th. Any pre-match rituals that you’ve found really helpful? Do you avoid certain foods? Do you have to have a certain amount of sleep? How do you calm down if you get really nervous? Yes. I have a book with notes for all of the stages. Before the match, I’ll go over every stage, getting into the mindset for the match. I’ll also review again before each stage. I get normal nights sleep and I eat a light breakfast, and then graze throughout the match. I’ve adopted a regimen of “reload the gun, reload yourself’. I rehydrate after every stage and eat something small every other. By doing this I never get thirsty or hungry during a match. When shooting 2 sessions with lunch, I again eat light. If subs are provided, I don’t eat the bread. You’re there for the match, not the free food. I have a pre string ritual as well, and this tends to calm me down and get me focused. Before the first string I sight in every target to ensure I can see my sights/dot and adjust as necessary. Then before every string I have a mantra, “It’s like me to go fast, one for one is the fastest, get a good first shot, etc”. Find the words of encouragement that work best for you. Do you dry fire practice? How often do you do dry fire practice? Does it actually help? No, but I should. I live 20 minutes from our range, and I have keys, so I can live fire more than most. I’ve also focused on rim fire and am just getting into center fire, so my dry fire will increase. I’ve have dry fired for USPSA and it definitely helps. Any tips on maintaining confidence? No matter what the timer says I don’t feel as if I’m shooting fast. I don’t consider myself to be a particularly fast shooter even if I place well. Seems like one has to strike a delicate balance between being humble but not too humble. Find the gems you can focus on. Don’t remember the miss on string 3; remember your smoking time on string 4. Staying positive will increase your confidence for the next stage. Steel Challenge is a sport where you are competing against others, but you are also competing against yourself, and you can determine if you’re improving. You may not win the match, but if you dropped time, you got better. Conversely, if you didn’t shoot as well, you know what needs to be worked on in practice. I go into matches saying I’m going to have my best match and not worry about how others are doing. I only have control over my shooting, not theirs, and I don’t worry about things I can’t control. Everyone has a maximum speed and a match speed. We’ve all crushed Smoke & Hope in practice, and then were slower in a match. This is because there is no pressure in practice, misses and extra shots don’t matter in practice. Match speed and practice speed differ, but they are intertwined. Match speed is about 85% of practice speed. If you increase your practice speed, you increase your match speed. Don’t confuse being humble with being confident. When getting a compliment, be humble, say thanks. When getting ready and when shooting, be confident and be your biggest fan. Thank you again to Martin and Jeff for their help! If you have any questions you would like to see answered, please send them to stevefostershooting@gmail.com.